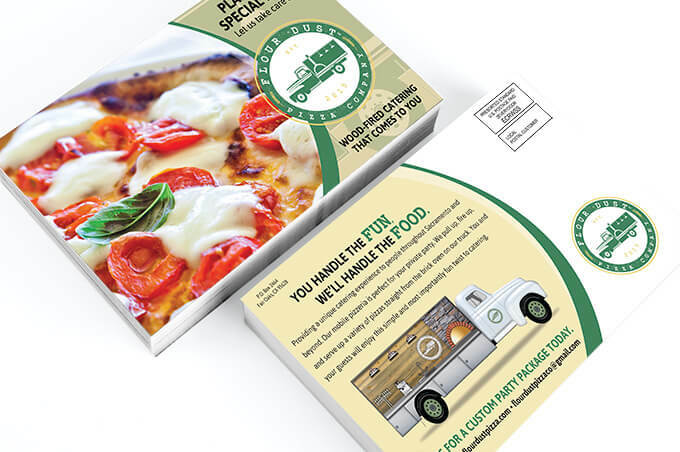 EDDM® (Also referred to as Every Door Direct Mail®) are oversized postcards or “flats” that are designed to reach all addresses in targeted zip code(s) or USPS® mailing route. Are you aware that approximately 85% of small business customers arrive from a 5-mile radius? With the help of these affordable postcards, you can reach new customers with our easy-to-use mapping tool. Bring awareness to your business, event, product or services. 40% of customers will try a new business after receiving a mail offer. We apply a clear Spot Gloss to select areas of the postcard such as text, photos, logos or even patterns. Every Door Direct Mail® gives local businesses the ability to target local customers for less than traditional direct mail services. Grow your business and reach more customers with this affordable service. Spot UV Gloss: Selective spot UV gloss is available on 1 or 2 sides. Options: Spot UV on back only, Full UV on the front. Spot UV front only, No coating on the back.